London magistrate Aeneas Posket is as predictable and dependable as they come. He is good-natured, and something of a pushover--evidenced by his servants hired from the Mulberry Street Police Court. He is also recently married to Agatha, a widow with a teenage son. However, Agatha has been hiding her real age from her husband, and convincing everyone that her boy Cis is only 14, when he is really 19 years old--and (unbeknownst to her) drinking, smoking, gambling, and chasing girls! Unexpectedly, a blast from the past returns to London--a friend who could reveal Agatha’s real age, prompting her to take action in order to keep her secret. At the same time, precocious Cis convinces his stepfather to have a night on the town--an experience the dull Mr. Posket has never had. But a police raid changes their fortunes, and Mr. Posket finds himself scrambling to hide his late night adventures so that he can preserve the integrity of his career. 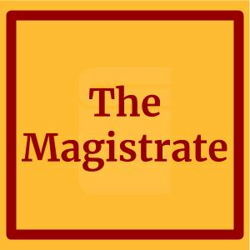 The Magistrate: A Farce in Three Acts was Arthur Wing Pinero’s first success, and often revived to resounding slapstick success.